You must enrol within two weeks of the start date of your program, as indicated in your offer letter. You will receive full enrolment details after you have applied and been successfully accepted on your program. Undergraduate diploma – if this is from an institution outside of Turkey, you must submit a document demonstrating that an application has been submitted to the Turkish Council of Higher Education (YÖK) for a letter of equivalence (the letter of equivalence must be submitted by the end of the first semester). For programs conducted in Turkish, original Turkish proficiency document. For programs conducted in English, original English proficiency document. Passport and approved Turkish translation. Receipt demonstrating that the tuition fee, which is annually specified by the University Administrative Board, has been paid, or documentation of scholarship. 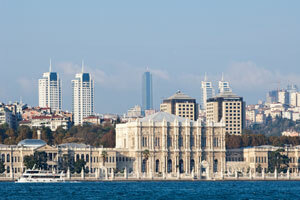 A copy of your student visa from a Turkish embassy or consulate in your home country. We strongly recommend all international students come to Turkey with a valid temporary health insurance policy. International students are responsible for costs of hospitalisation or for any medical service or treatment not available at the University Health Centre. As an international student studying in Turkey are able to get General Health Insurance to benefit from the health services provided by the state. In order to benefit for the General Health Insurance, you must report in person to the Turkish Social Security Institution (SGK) and complete their insurance application within 90 days of your official registration at the University. You will be responsible for your own monthly payments of health insurance contributions. You should receive an SGK number upon the registration at the health authority. If you have General Health Insurance, you can benefit from private hospitals, although this will require additional fees, or from state hospitals, without additional charge and upon presentation of your insurance number. If you don’t wish to benefit from the General Health Insurance, you can apply for private health coverage, offered by different health insurance companies. After you have arrived in Istanbul and enrolled with Kadir Has University you will need to obtain a Residence Permit, a Foreign Identity Number and a Tax Number. Further information and support will be provided once you have enrolled on your program in Istanbul. A Residence Permit is an official document stating registration with the Directorate of Security (Emniyet Mudurluğu). All international students are required to register within 30 days of arriving in Turkey and obtain this official document. Your Student Visa is a single-entry visa until your Residence Permit is obtained. If you leave the country before obtaining a Residence Permit you will not be able to re-enter Turkey. To obtain a Residence Permit you will need to make an appointment at the Directorate of Security. Your Residence Permit will need to be renewed every semester of study. Kadir Has University will provide support to help you to obtain your Residence Permit. Students who have been issued a Student Residence Permit must then obtain a Foreign National Identity Number. This number is required for official purposes such as opening a bank account within Turkey. Kadir Has University will provide support to help you to obtain your Foreign Identity Number. In Turkey a tax number (vergi numarası) is required to open a bank account. To obtain a tax number you will need to visit a tax office with photocopies of your passport. Kadir Has University will provide support to help you to obtain your Foreign Identity Number.